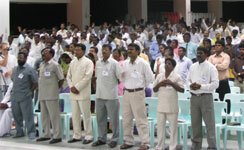 The cause and effect of our third conference has encouraged us to host the fourth bigger and wider pastor's conference for the district of Kanchipuram, solidifying the bonds that we have been building with pastors in Chennai and the surrounding areas. This conference will provide encouragement and unity amongst the local leaders, many of whom labour alone in their churches. "The One-Body Project" is the theme for the conference, and it all stems from the idea that God's project is the church. Too often, our project is ourselves. Our agenda. Our promotion. Our blessing. Imagine if the church could come together, knowing that we represent one another, with a determination to be the readied Bride Christ is returning for.